The volume of funds pledged in the defense budget within the state budget of Ukraine for 2019 to finance the security and defense sectors is encouraging and should allow an increase in the rate of production and transfer of weapons and military equipment to Ukrainian security forces, NSDC Secretary Oleksandr Turchynov has said. "Security and defense sector should be financed at more than 210 billion [UAH]. This is more than 5% of GDP, as the security and defense strategy requires," Turchynov told journalists at the Kyiv Armored Plant on Thursday. He noted that as soon as the defense budget is adopted within the framework of the state budget for 2019, the state defense order would be considered in a few weeks. 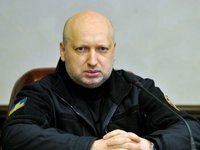 According to Turchynov, the pace of production and transfer of weapons and equipment to the Armed Forces of Ukraine, the National Guard and the law enforcement structures should be increased. Speaking about the possible timing of the adoption of the state budget for the next year, the secretary of the National Security and Defense Council (NSDC) expressed hope that the Verkhovna Rada would adopt it in late November.